In this episode, I’m answering a listener’s question: do I need to learn html and where do I go to learn html? Hi there and welcome to another episode of the pint sized podcast where we answer your questions on wordpress and websites. I’m your host Kelli Wise of Pint Sized Sites. As a user of WordPress, you don’t NEED to learn html, but it can sure come in handy. So, I’m going to tell you, yes you should learn html. Html is an acronym for hypertext markup language. While that might seem like a mouthful of jargon, it’s actually pretty descriptive. At it’s core, html is ‘markup’. If you’ve been around computers as long as I have, which isn’t likely, you might remember a time when word processors, like WordStar, required that you add code around words that you wanted to make bold, italic, or bigger. So, you would type and little pointy bracket, add a b for bold, and another pointy bracket. Then you would type the words you wanted in bold. Then another pointy bracket, a backslash and b to tell it to stop doing bold. And finally there was another pointy bracket. We were marking up the text in our documents to add styling. That’s where the ‘markup’ part of that acronym comes from. What about the hypertext? Well, our old pal Merriam-Webster – the Pint sized online dictionary of choice– defines hypertext as “an arrangement of the information in a computer database that allows a user to get information and to go from one document to another by clicking on highlighted words or pictures”. Ignore the database part of that definition. The important part is being able to go from place to place by clicking on a link. What is a web page without a link? Pretty insulated and mostly useless. So, with html, we can add links and we can add tags that will add styling to the text. Since the html ‘code’ is defined, we’ll call it a language. Back in the old days, like 10 years ago or so, websites were written entirely in html. It was fun (if you’re weird, like me) and tedious. 20 years ago, not only was I writing websites in html, but every single element in the page had to be individually styled. Every time I was to use red text, I had to wrap that text in html that made it red. THAT was tedious. Fortunately, 20 years ago, we were so limited in what web browsers would display, that the coding was not all that huge. Really, we had bold, italic, a few colors, and maybe we could add a picture of rocks as a divider. If you’ve been around long enough, you’ve seen those rocks. And then we had blinking text, but until the nightmares about that fade, we’ll just pretend blinking text, dancing babies, and flying toasters never happened, ok? It didn’t take long before someone found a faster, more efficient way to add all of this styling without having to type color=red over and over and over. This is where CSS, or cascading style sheets, comes in to the picture. Now, we can move all of the style information into one document and use the html to just tag the text with things like heading, bold, list item, and such. But, wait, you thought I was talking about html in this episode! Well, I am, but honestly, html without css is like soup without salt or bikes without pedals. They are integral to one another. Fortunately, you can learn them separately, although you must start with html first to understand css. Sounds complicated, doesn’t it? Well, it can be, which is why platforms like WordPress, Wix, Weebly and the like are so popular now. You don’t strictly need to know html, or css, to use WordPress to build a website. Why? 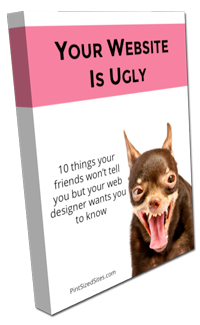 Because WordPress and the theme designer have done all of the html and css work for you. So, why might you want or need to know html? Well, on occasion, you’ll need to add some button code to a page or tweak the contents of a widget. Knowing what all that extra code is and what it’s doing can be really helpful. Or, you might be interested in designing your own theme or just editing a theme, in which case, you’ll really need to know html and css. You can also tell a lot about someone else’s website by looking at the source code for it – all the html that the browser sees. You can also see anything questionable like hidden links to malware sites by looking at your source code. Some email management services, like Aweber, allow you to put html in your emails you send to your subscribers. Html is the language of the web, so if you are willing to learn it, you’re going to be able to do a lot more online. Which brings us where to learn html. You can sign up for a college course at your local community college. That will cost you some money, but the accountability will keep you on track and doing the work. Plus you can ask the instructor questions. If you’re like me, though, you don’t want to wait for the next semester or quarter to start, you don’t want to drive to a class, and you’d like to save some money. There are online courses available for you that are quite good. My favorite, hands down, is on Coursera. There will be a link to Coursera and the html course I’m recommending. While Coursera has more than one course on html, the one I am recommending is title “Introduction to HTML5” which is created by the University of Michigan and taught by Colleen van Lent, Ph.D.
I’ve worked through most of the css course and most of the html course by Ms van Lent and I am blown away with how good she is as a lecturer. She has clearly mastered the art of teaching. Her teaching style is conversational – yes she uses big words on occasion, but she makes sure to explain them. She makes some of the more difficult concepts easy to grasp. Her explanation of the difference between display block vs inline block vs inline was probably the best I’ve ever come across. I’ve been doing websites for a very long time now, since about 1997, and I still learned a couple of new things from her courses, or at least new ways of describing them. I really cannot say enough good things about this course. To make it even more appealing: it’s free! Yes, you can pay a fee and get a certification, but you can also audit the course for free. I have a local graphic designer friend in town who is adding html to his skill list and I recommended this course to him. He’s tried a couple of other courses, but ended up lost at the start: what is a text editor and how does he use it? Week 1 will get you started with intros of what html is and it’s evolution, what browsers are and how to use a text editor to create an html file. It really does start at the basics. By week 2, you get started on some coding. You’ll learn what html tags are as well as images, hyperlinks and tables. There are plenty of projects to practice on. Week 3 covers validation, accessibility, hosting, file transfer and more. As introduction courses go, this one is pretty comprehensive and covers useful skills and tools. If you want access to an online reference and a free online course, then the w3schools.com is another way to go. W3Schools will walk you through html, concept by concept. It also provides a means for you to play and text code live without using a text editor. The w3Schools site also acts as a pretty good reference for html. I mentioned text editors earlier and I have a couple of free recommendtations for you. A text editor differs from a word processor in that it does not add any extra styling. When you look at a Word document, there is a lot of markup that you don’t see but that helps with the look of the document. Things like headings, bullets, and more. This means that you can’t use a word document to create an html document. There’s just too much extra stuff that Microsoft adds. So, you want a program that only creates text and nothing but text. There are several text editors out there that you can pay money for, but I’ll assume you only want to learn html, not become a web developer. In that case, you don’t need all of the bells and whistles that I use. For Windows computers, I recommend Notepad++. That’s 2 plus signs. It’s an amazing piece of software and I used it extensively when I still used Windows computers. It’s available from the web as a download. For Mac, I recommend TextWrangler. While not as powerful as Notepad++ or paid apps, it will do pretty much everything you need it to do. It’s available on the iTunes store. Links for all of this will be in the show notes on Pint Sized Sites dot com. I hope you explore html a bit. It’s not as complex or intimidating as programming languages but it comes in mighty handy if you have a website, even something as user friendly and code –lite as WordPress. Pint sized sites dot com / Podcast for links to this episode. You’ll also find show notes with all the links mentioned here and you’ll find all of the earlier episodes, too.